“By showing your major and minor marks, you instill in us lucid faith. Fulfilling the needs of fortunate ones through supreme siddhi. When the child was brought to Tsawa Phu in Kongpo, Khacho Wangpo immediately recognized him as the incarnation of Rolpe Dorje, and presented him with the Black Hat and other possessions of the fourth Karmapa. He went on to give the Karmapa the full cycle of Kagyu teachings, and the Karmapa soon completed his traditional training. During the lifetime of the fourth Karmapa, Emperor Zhu Yuan Zhang of China invited the fourth Karmapa to visit him in China. The visit had never took place; instead, Rolpe Dorje sent a lama as his emissary. Later, Emperor Yongle had a vision of the Karmapa as Avalokitesvara, the bodhisattva of compassion; thus he invited the fifth Karmapa, at the age of 23 (1406), Karmapa made a three-year journey to reach the imperial palace. Young le became an extraordinarily devoted student of the Karmapa, whom he took as his guru. Chinese records speak of the Karmapa’s manifestation in response to such devotion as a hundred kinds of miracles. The emperor recorded these events for posterity in silk paintings with a multi-lingual commentary. Following in the footsteps of the two previous Karmapas, Deshin Shekpa subsequently made a pilgrimage to the famous Wu-tai Shan sacred mountains, to visit his monasteries there. 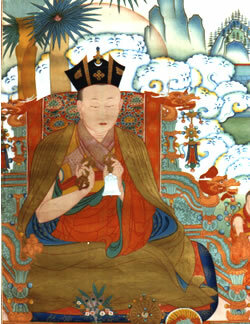 The emperor achieved some realization, and had a vision in which he saw the wisdom Vajra Crown above Karmapa’s head. So that all beings might benefit from seeing something of this transcendent aspect of the Karmapa, the emperor commissioned the creation of a physical replica of the wisdom Vajra Crown, which he saw as a black hat. He presented it to his guru, requesting him to liberate those who saw it by wearing the crown on special occasions. This was the beginning of the Vajra Crown (or Black Crown) ceremony. The emperor also offered Karmapa the highest-ranking title: “Ta Bao Fa Wang,” (Great Precious Dharma King) with a golden seal. In 1410, Deshin Shekpa returned to Tsurphu to oversee the reconstruction of Tsurphu, which had been damaged by an earthquake. He recognized the Shamar reincarnation of Chopal Yeshe and spent three years in contemplative retreat. The next lineage holder, however, was the Karmapa’s student Ratnabhadra. Realizing that he would die at a young age, he left indications of his future rebirth and passed away into parinirvana at the age of 31. In the ashes of his cremation fire were found relics, naturally-formed images of many Buddhas.